Teng Jianqun*, American Studies Department and the Centre for Arms Control and International/Security, China Institute of International Studies. "Missile Defense on the Korean Peninsula"
Why Is China Unhappy with the Deployment of THAAD in the ROK? On March 16, 2015 during his visit to South Korea, Assistant Foreign Minister Liu Jianchao in talks with his counterparts reiterated China’s concern on the possible deployment of US THAAD in South Korea.1 Taking into account geopolitics and international relations, why has China taken such a strong position against this program? What are the US reasons for pursuing this program? Can South Korea accept the US invitation to participate? These questions are now puzzling the countries in this region. As everybody knows, missile defense from TMD to NMD has long been a dream for the United States. THAAD is an important part of the current missile defense program. Originally standing for “theater high altitude area defense,” today it signifies “terminal high altitude area missile defense.” The THAAD missile defense program was first proposed in 1987, and instructions to build this capability were transmitted to industry in 1990. After several rounds of failed tests, in June and August 1999, the first successful tests were conducted. According to its design, it is to shoot down short, medium, and intermediate ballistic missiles in their terminal phase by using so called hit-to-kill technology. Renamed from HIGH to TERMINAL, the change in wording shows the main concerns of this program. Technically speaking, the killing part carries no warhead, which relies on the kinetic energy of the impact to destroy the incoming missile. Such a hit would minimize the risk of exploding conventional warhead ballistic missiles; and nuclear tipped ballistic missiles would not explode upon a kinetic energy hit. Although THAAD was designed to intercept Scuds and similar weapon systems, it also has the capability to intercept ICBMs. What worries countries most is the radar systems used by THAAD, which include the X-band active electronically scanned array system—the world’s largest ground/air-transportable system as a forward sensor for ICBM missile defenses. The United States mentioned that such a radar system is to be used to scan any missile launched by the DPRK in this region and would do no harm to the strategic balance among the three nuclear weapon states, Russia, China, and the United States; however, with the surveillance distance of 1300 kilometers, such a ground/sea based radar system, of course, would cover a large area of China and Russia. Already these systems are being deployed in Alaska and Japan, and in 2014, China repeatedly criticized the United States for X-band radar deployment in Kyoto. To some Chinese scholars, such a system is actually a “silver bullet” in the hands of the United States. Their argument is based on several reasons: 1) a missile defense system is a bullet-to-bullet game, which still needs time to perfect its capacity in many aspects; 2) as a defense system, it could not be efficient in reacting to an attack from any point in a 360 degree defense circle; 3) in the planned deployment, while facing Russian and Chinese multiple launches at the same time, THAAD only succeeds in a small percentage of cases. On the one hand, Russians and Chinese would not perceive this system as efficient, since it could not provide 100 percent protection; on the other hand, the two countries are showing great concern over the strategic impact of it. From the late 1980s, experts and officials have paid great attention to the missile defense program of the United States, first TMD and later NMD. If one looks at the US missile defense deployment in the Asia-Pacific region, one can find a circular chain already in position along the eastern part of China. In a paper published on February 22, 2010, several experts argued that Washington has appeared determined to surround China with its anti-missile systems from Alaska to Taiwan. According to the US-based Defense News, Taiwan became one of the largest global buyers of the Patriot missile defense system following Japan, the ROK, the UAE, and Germany. Quite a few Chinese military experts have noted that Washington’s proposed weapons deal with Taiwan is a key part of US strategic encirclement of China, and that the missiles’ footprints extend from Japan to the ROK and Taiwan. 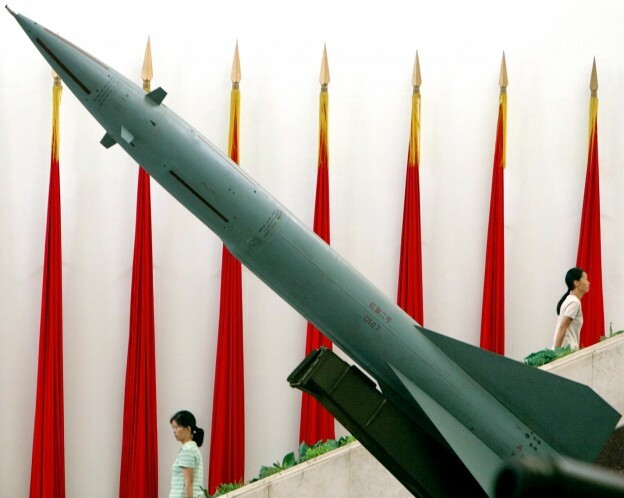 Chinese experts consider the US anti-missile system in China’s neighborhood to be a replica of its strategy in Eastern Europe against the Soviet Union. The ring encircling China can also be expanded at any time in other directions. Analysts say that China has been closely monitoring US-India missile defense cooperation since any integration of India into the US global missile defense system would profoundly affect China’s security. China’s senior officials take every opportunity to express their concerns over the US missile defense program. On April 12, 2012, Luo Zhaohui, Director-General of the Department of Asian Affairs with the Foreign Ministry, during an online chat hosted by People’s Daily, noted that after the DPRK announced its intention to launch a satellite, the United States stepped up coordination with Japan and the ROK to prepare to adjust its military deployment in Northeast Asia and the Asia-Pacific region. He said, “The Chinese government always insists that (countries) should start by maintaining global strategic stability and promoting strategic mutual trust between major powers to handle the issue of missile defense prudently.”4 According to Reuters, a US defense official said on March 26, 2014 that the United States was seeking to build a missile defense system in Asia and the Middle East, similar to the one in Europe, to help relevant countries ward off threats from Iran and the DPRK, and prevent possible long-range missile threats against it. By the end of 2014, the discussion over the possible deployment of THAAD in South Korea again preoccupied the media in China and the ROK. In November 2014, Ambassador to South Korea Qiu Guohong warned that if South Korea allows the United States to deploy the THAAD battery on its soil, it would hurt Seoul-Beijing relations. Why Is China Not Happy with the Possible Deployment of THAAD in the ROK? We should discuss this issue from a wider scope since the deployment of THAAD has already gone beyond the boundaries of technological development of missile defense by the United States. It is of geopolitical and strategic significance for international relations in Northeast Asia. Starting from the early 1990s after the Cold War ended and the United States largely abandoned its Star Wars plan initiated by the Reagan administration, South Korea has been very cautious in responding to invitations from the United States to participate in missile defense programs. There are many reasons to explain its cautious response: 1) the sensitivity of the program—participation would damage its security environment as North Korea, China, and Russia would make South Korea a target; 2) technology related to missile defense program has been so uncertain that even the United States has doubted its capacity in dealing with the so-called missile threat from North Korea; and 3) South Korea has its own ambitious KMD plan, which mainly targets the short or medium-range ballistic missiles from North Korea, while THAAD mainly targets ballistic missiles over 5000 kilometers in range. Why suddenly has South Korea been reconsidering its reluctance to participate in the missile defense program of the United States? There are several possible explanations: 1) fast development of the DPRK’s nuclear and missile technologies—especially after the third nuclear test by the DPRK, we have witnessed a growing debate in South Korea on the possibility of cooperation with the United States on the missile defense program; 2) the public’s increasing nervousness about security—under the threat of the DPRK’s artilleries and missiles, the South Koreans will feel much more comfortable when they can see some kind of missile defense program on their territory; and 3) the traditional alliance between the United States and South Korea, which needs a new driving force to go forward at this moment. The deployment of US THAAD has become, at least to some extent, a hot potato in South Korea. On the one hand, it would provide South Korea new protection in missile defense though it is not strong enough to give a 100 percent guarantee. On the other hand, South Korea again has to take full consideration of the response from relevant countries. China has already repeatedly reiterated its position on the US missile defense project in Northeast Asia, expressing great concern not only about THAAD but also about the entire missile defense program. Russia now is facing two fronts in fighting against the US missile defense program, both in the Asia-Pacific region and in Western Europe. The DPRK, as the major target of the US program, will continue to criticize the deployment of any advanced weapons system in this region. These responses from the relevant countries will exert a strong negative impact on the security situation. Park Geun-hye’s administration should thoroughly study this before any decision is made related to the US missile defense program. The opposition to the US deployment of a missile defense system in this region should not only be a technical or security matter. Behind the curtain of competition is the relationship among the United States, China, and South Korea. The pivot or rebalancing strategy by the Obama administration is a double-edged sword for the regional countries. China has recognized the pressure from the United States on its security. South Korea has also recognized the pressure from the United States. The enhancement of the traditional alliance has already become one of the most important pillars to rebalance other countries. As we all have witnessed recently in the more than two years since President Xi Jinping and President Park Geun-hye took office, the relationship between China and South Korea has entered a new stage. China has adjusted its policy toward the DPRK and ROK by trying to have a more balanced relationship with the two. Under such circumstances, the Park administration should not be willing to stop such good momentum in cooperation with China. In conclusion, the possible deployment of the US THAAD system in South Korea will test relationships among China, South Korea, the United States, or even Russia. It is not simply a military project for the sake of South Korean and US security. Other factors are already involved, and China has raised its voice against this program. If necessary, China will take some solid measures to counter the power of the US missile defense program, including updating and increasing the number of its conventional and nuclear warheads. South Korea has become the most important area for the United States deploying systems such as THAAD. South Korea used to be very cautious toward the US proposal, but today has become more flexible to the possibility in consideration of geopolitics, the economy, and the security relationship. Sandwiched between the two major powers in this region, South Korea has to make a tough choice over the deployment of THAAD in the near future. 1. Assistant Foreign Minister Liu Jianchao anticipated that South Korea should have considered China’s concerns, http://chinese.yonhapnews.co.kr/domestic/2015/03/16/0401000000ACK20150316001500881.HTML. 2. Address by H.E. Yang Jiechi Minister of Foreign Affairs of the People’s Republic of China, Conference on Disarmament Geneva, August 12, 2009, http://www.fmprc.gov.cn/ce/cebe/eng/zgwj/t578020.htm. 3. See Chapter 1, “The Security Situation in China National Defense in 2010,” issued March 31, 2011, http://news.xinhuanet.com/mil/2014-06/13/c_126613625.htm. 4. Director General of Asia Department of the Ministry of Foreign Affairs, “On China’s Diplomacy in Asia, 2012,” http://fangtan.people.com.cn/GB/147553/242012/index.html. 6. “China criticizes US for X-band radar deployment in Kyoto,” Xinhua, October 23, 2014, http://www.chinadaily.com.cn/world/2014-10/23/content_18793312.htm. 7. See Xinhua New Agency report on June 13, 2014, http://news.xinhuanet.com/mil/2014-06/13/c_126613625.htm. 8. See Dakungpao report, May 29, 2014, http://news.takungpao.com/world/exclusive/2014-05/2505223.html.